In my previous post, I essentially claimed Verdant Tea was massively overcharging customers for a low end product- an eye-popping $156 for the Yong Ming 2006 "Star of Bulang". To be clear, I support Western pu-erh vendors that provide interesting selections or even charge more for premiums products. I'm mostly against Western vendors that charge arm and a leg for low-end stuff glorified with a story. I had confirmed with MarshalN my suspicions on Verdant Tea but I wanted to also provide my readers with concrete proof and also a simple way you can do a sanity check on prices. David Duckler wrote me and claimed "Our markup is extremely low." 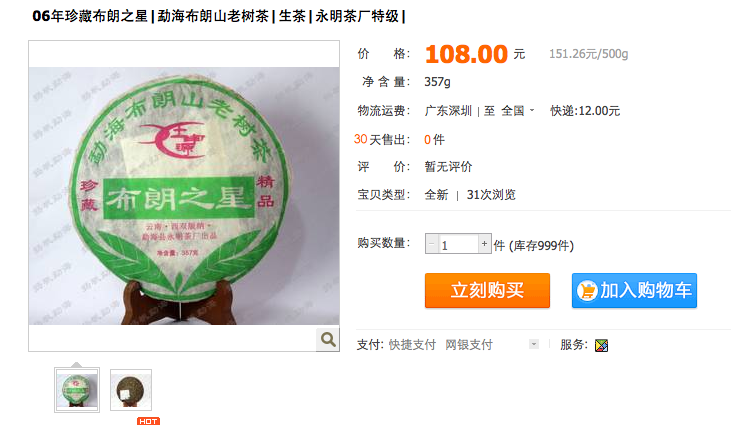 You can now make up your own mind against the 900% markup compared to the Chinese price as shown below. 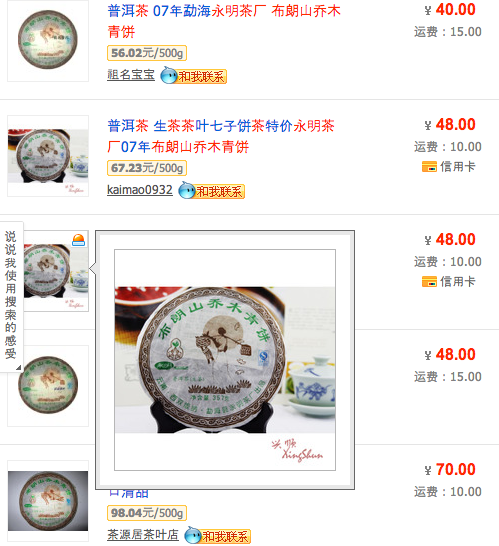 布朗之星 = "Star of Bulang" 永明茶厂 = "Yong Ming Tea Factory"
We see that the supposed "ultra premium" Yong Ming Star of Bulang sheng is going for a mere 108 yuan which is about $17 taobao. 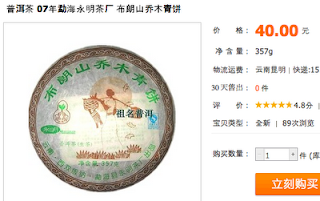 As mentioned, selling a "Star of Bulang" which is not a Star of Bulang is misleading but this is still moot when the price of a 2007 version is going for as cheap as 40 yuan($6.30). Beengs from low-end factories like Yong Ming do not have a 2600%+ increase for the same cake released only a year apart ($6 to $156). Even cakes from high end factories don't have a 100% increase between years. Given the 2007 version goes for as low as $6.30, the 2006 Bulang Qing Bing should not be over $17 regardless. Whether or not Verdant Tea was selling the Star of Bulang and switched to the Qing Bing, their markup is eyepopping. I would not consider this an "extremely low markup". If Verdant Tea is in fact being scammed and mistakenly paying a really high price for this low-end tea and passing the blunder onto the customer, then I guess it's definitely one more argument against buying pu-erh from clueless Western vendors. You will be essentially paying at least $100 more for his opinion and marketing stories around the tea than rather than actual value. It's 3:30 am Sunday morning so you can see I really wanted to take great care in not putting negative feedback about a vendor unless I had reasonable cause. David renames Yong Ming Factory to "Yong Ming Workshop" since Verdant Teas makes a big do about not dealing with big factories. He states of his source"Wang Yanxin has amassed the most unique and outstanding collection of pu’er we know of through dedicated work with small growers in stead of the large workshops. " on Why Verdant Tea is Different. But YongMing is a nothing special factory selling low end stuff. Menghai Tiandiren Tea Factory is also a pretty big low-end factory that used to make cakes for CNNP. Verdant Tea also makes it hard to see what pu-erh you are really buying- i.e. the description seems be deliberately hiding the real factory names so you cannot do comparison shopping. "2004 Willow Grove Workshop?" MarshalN has kindly translated the factory 勐海楊記天緣茶廠 which literally means "Menghai Yang's Sky Serendipity Tea Factory" which he found for less than $10 for the 2005 version. Where does "Willow Grove Workshop" come from? Or where does "Peacock Village" from their Tiandiren shu come from? "A brand-new sheng should exhibit three main characteristics if it is to become a great tea. It should be sweet, smooth, and have a flavor or interest that you could see developing into something amazing." I need not stress that that is the kind of sheng he is selling. I highly recommend MarshalN's post on the futility of chasing taste. There has been a trend in the last few years for factories to produce sweeter fragrant cakes with more buds and young leaves manipulated to be consumed now. There is enough empirical evidence that sweet smooth cakes have shown NOT to age well. Just flip through the half-dipper. No one really knows definitively what ages well but strength (cha qi) and presence of huigan and kuwei is often mentioned, as well as complexity from wild tree. For a Western vendor trying to sell sheng to new pu-erh drinkers, they have to carry sheng that can be drunk now to beginners which is not necessarily the tea that will age best. I want to spend time writing posts about the appreciation of tea and not being ripped off or being scammed. It's unfortunate that the pu-erh market is filled with so many gaps in knowledge that the consumer can be taken for quite a ride. Good night! Typo - 勐海楊記天緣茶廠. Literally Menghai Yang's Sky Serendipity Tea Factory. Not sure where Willow Grove came from. By the way, any shu brick from a no-name factory should cost no more than about $20. I did find this from Taobao, 2005, not 2004, not that it makes any difference. Either Verdant is a scammer, or it's a scammee and is just passing it on. Regardless, avoidance is probably a good policy. Everyone is entitled to their own opinions, so I am not going to extensively involve myself in this discussion, though I do find certain comments to be a bit objectionable. I just want to state a few basic points to take into consideration. We can disagree on method and taste, but I am not a dishonest merchant, nor a scammer. Please understand this. I don't want to get into an argument on pricing based on shipping and brokerage / Taobao, nor do I want to convert you to the flavor profiles I am interested in. I merely want to emphasize the honesty of our cultural exchange project that is Verdant Tea. 1) I am not sure that Taobao does not have a return policy. All that fees you mention - do the potential customers have to pay them too? More importantly, taobao may be used as a reference of what is low end and what is high end tea. Not caring about the import costs, the taobao offer suggests that the Star of Bulang is a low end tea. And should such a tea cost $156? I am afraid that definitely not. 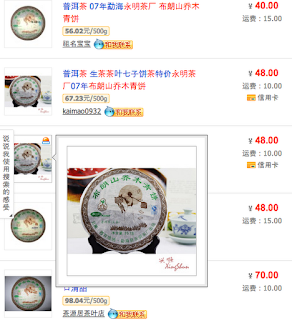 Look at what teas you may get for such a sum of money from Yunnan Sourcing/Chawangshop/Essence of tea. Even if the Star of Bulang was a very good low end tea, such a cost would be still crazy and scamdalous. I am not that sure if discovering a nice tea should lead to higher price. For example, the 2005 Menghai Gu Cha from Chawangshop is a surprisingly good tea... yet it still costs meager $14. If the tea is good, why to charge more? If one is vendor, he is supposed to find good tea for his customers - why to ask more money? 2) Ehm, pray tell, what do you consider to be "aging"? Five years of storing a tea? How many teas have you seen to age from young, sweet and all that to something marvellous? Not many I believe, as tea was not produced like that until recent times and I doubt that any of these teas would reach the aged stage. So I think that no one can actually say how these teas will age well (especially as some of these got weak and bland after two or three years of storage). For example, a fellow here was a Xizihao fan - and he was blown away in the last year by their Laowushan an Manning, how they were sweet, fruity, aromatic and gentle. Now, after a year, they are, in my opinion (and in his saddened opinion too) weak, bland and having only remnants of the former positive features. This is what I was pondering in my "Some thoughts on modern tea and its aging" - what is good now may not be good in few years. And there is very little experience with the new style of puerh so any statements on such a tea should be humble. You say you know that the qualities will grow in an intriguing way - is there any evidence to support the statement? Btw. many people have fell in love with green tea via green tea dust aromatized tea sacks. Does it make it these "teas" anything above crappy crap? Nope. I agree. I also feel like there's a rather obvious point being missed here — if you want to drink tea that has a sweet taste right now, you don't typically look for young raw pu-erh. It's kind of like looking for a shirt that could be used as a pair of pants. I mean, maybe you'll find one, but that's not really the point of it. The reason that young raw pu-erh is probably not going to taste sweet both now and later is that fungus and bacteria process the tea. To give perspective in more common terms: Does milk taste the same as cheese? Does wine taste the same as grape juice? Does beer taste the same as a broth of barley, hops, and yeast? — In all cases, no. What you start out with is not what you end up with, that's the entire point. That's why you're transforming it — because you want something else. There'd be no need to age a tea if it were palatable at the start. But, (and this is of fundamental importance to remember) what's palatable to a human tongue is not the same as what's palatable to fungus, bacteria, yeast, and all the other microorganisms that are contributing to the transformation process. As an example, I purchased a young raw pu-erh cake about ten years ago. It was so bitter I could barely take two sips when I got it. Thankfully, the bacteria and fungus didn't feel the same way I did, because after ten years of leaving them alone with it, that same tea had no trace of bitterness, was honey-sweet, and could be steeped for ages without losing its exquisite flavor. Could a tea be sweet both now and later? Perhaps. But, that isn't often what happens. Mainly because there's a biochemical process occurring there which changes things and rarely do things come out the same way they went in. I mean, consider grape juice which is very sugary-sweet to start. How many wines are sugary-sweet like grape juice? There's cheap table wine and wine for ceremony and then there's expensive ice wine which uses frozen grapes and turns out inherently sweeter than other wines. But, by far and large, wine is not sugary-sweet. There's a quality that is referred to as "sweetness" but it bears little resemblance to what is referred to when using the term "sweet" to refer to grape juice. But, again, this makes sense. Because, if you wanted something sweet like juice, you'd probably be drinking something else...you know...like juice. This also applies to tea. It almost feels like a gross misinterpretation of what pu-erh is that anybody would ever be looking for a sweet, young, raw pu-erh to drink immediately. Thank you for calling Verdant Tea out on this. I felt swindled by them and I'm happy if this blog post and comments can help to keep others from feeling the same way. Considering the thoughtfulness of your writing- I expected you to have a tea blog somewhere. If so- please point us there. Also please do tell us the identity of your purchase of “young raw pu-erh cake about ten years ago” and your storage conditions. On Verdant Tea- I have come to accept that there will be such leeches in the tea ecosystem. I am not surprised Verdant Tea has not amended their ways as their marketing is working for them as there is no shortage of novice beginner drinkers. Thank you for the link on micro biomes of puerh. I will digest it slowly. Steepster reviews for Verdant teas are great. Ah... Oh... all made around the same period by people who almost exclusively review Verdant teas. No, no Verdant for me, thanks. I am calling bunk on David's arguments as well..they don't seem to hold much water at all. I've been ordering tea direct from China to the States and would never dream of bothering to order from a merchant for such a price when I could get it elsewhere for substantially less. I can't see any reason to up-charge such an enormous sum. David Duckler, it feels very scammy, I would have fessed up as a business owner and take it as a mistake in pricing and refund all my customers who bought the item. Taobao full of scammers? look at yourself. Agent to find and pick the tea? I find that hard to believe. You can scam the newbies to pu erh, but you can't scam the average pu erh drinker. I made a few orders with Verdant Tea, but I'm really unhappy with the experience and at this point I'd consider it a learning experience more than anything. That's what really got me suspicious. Then, I started comparing prices. I mean, for those teas that I did like, I didn't mind paying a little more because I thought that they were special. But, the rest of them? They were probably 4x the price of other vendors. And, yes, I know that their teas are supposedly "grown naturally" but there was no documentation I could find to support that. So, really, who knows! Meanwhile, companies like TeaVivre post the certifications for their teas and charge sometimes as low 1/4th the price Verdant Tea charges. Couple that with the comparatively longer waiting times for them to respond to e-mail inquiries, the fact that even if you e-mail them there's no guarantee that they'll give you the free sample you actually want (they gave me a sample of tea that was out of stock with my last order, so it felt like they were using me as a garbage can, I mean I couldn't order more of it so what use was it to me? ), the lack of any ability to write reviews on their site (do they not want customers to share how they feel about products? ), the fact that they charge sometimes a lot more per gram for samples than for larger amounts of tea (do they not want us to try it first? ), and the stupid/ugly and unnecessary extra packaging that they put on bags of tea that already have labels on them (is that what all that extra money per gram of tea is paying for? ...because I'd never willingly pay for that...), and I have no desire to ever shop with them again. As I said, I'd consider it a learning experience. But, I'd never recommend them to anyone. The fact that these teas were found elsewhere for pennies isn't the least bit surprising to me. Actually, I'm glad that they're so lazy as to not have repackaged their teas so that we could figure out how ridiculously high their markup is, as opposed to just speculating. It's a shame every time I encounter this in the world of tea. It's such a great beverage, it's shame when such dishonest people get in the way of that.